The Diocese of Exeter has announced it will be withdrawing its plans to erect six wind turbines at three different locations in North Devon. The Diocese of Exeter has announced today, in a pastoral letter to the parishes of East Anstey, Chittlehampton and Black Torrington, that it is to withdraw its planning applications for two small agricultural wind turbines in each parish. Conservative-run Lincolnshire County Council has given more details on their planning policy designed to resist the spread of wind farms. WHEN Chittlehampton’s church clock stopped working, worshippers had to have a whip-round in the local pub to pay for repairs. The Coalition’s renewable energy targets do not outweigh value of the beauty of the English countryside, a High Court judge said yesterday as she rejected planning permission for a wind farm. A GIANT transporter carrying wind turbine components has closed a Northumberland road after crashing into a ditch. HUNDREDS of single wind farm turbine applications are being lodged in Scotland in a ‘feeding frenzy’ for subsidies, which are at risk of escaping proper scrutiny in the planning system, experts have warned. AN APPLICATION for a wind turbine at a farm near Chulmleigh has been submitted to planners, just a week after a neighbouring parish council recommended a similar application be rejected. 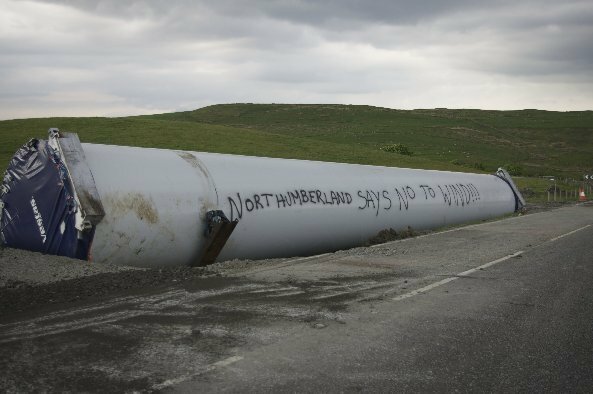 Conservative councillors are proposing that Northumberland County Council suspends future applications for wind turbines. The National Planning Policy Framework was published by the Government today. The policies in the Framework apply with immediate effect. Implementation arrangements are set out in Annex 1 to the Framework (pp 48-49). The Framework replaces the Planning Policy Statements (PPS) and Planning Policy Guiidance (PPG). Local policies still apply. Once we have had a chance to read the document we will add further information. Torridge and North Devon planners have been hit by a flurry of applications to put up wind turbines across the region. Will ‘industrial’ Atlantic Array spoil North Devon view? Broken down and rusting, is this the future of Britain’s ‘wind rush’? Is it time to abolish the Planning Inspectorate to stop further travesties like the Lyveden wind farm? The construction of more than 14,000 new homes and three wind turbines are planned under controversial government reforms, even though the regulations are yet to be finalised. Chawleigh Parish Council has recommended refusing a planning application for a 35 metre wind turbine at Philham Farm. Protesters yesterday gathered outside Torridge District Council offices in North Devon, where they handed a statement to councillors. "These things are heavily subsidised, they save very little money and I, for one, am totally against the plans." "I believe we should certainly look after our planet. I do not believe digging large holes and filling them with concrete to be the answer"
"…noise has been reported at distances of up to 4,800ft"
The South West is undoubtedly a leader in renewable energy technology. However one potential renewable source available in the South West relatively ignored is water. PEOPLE living near a wind farm north of Carmarthen say they have resorted to medication because the turbines are so loud. How much profit will a turbine turn? Developers of wind farms offer ‘sweeteners’ to local communities, but they may be tiny compared to the revenues. Plans for a wind turbine near Shebbear have stirred up mixed emotions. Letter to the Daily Telegraph signed by a number of public worthies. Prime Minister’s Question Time at approx. 12′ 54". In my area, there are plans for 120 metre-high wind turbines between the beautiful villages of New Marske and Upleatham, which are less than a mile apart. Does the Prime Minister agree that such giant turbines should not be built so close to residential areas without local people having a say? We want to see a balanced energy policy and there is a place for renewable technologies in such a policy. We are making two changes that I think will be welcome to the hon. Gentleman. First, we are cutting the subsidy to onshore wind, because I think that it has been over-subsidised and wasteful of public money. Secondly, when the Localism Act 2011 fully comes in, that will give local communities a greater say about issues such as wind turbines. Of course, we tried to do that earlier by abolishing the regional spatial strategies that the previous Government put in place, but we lost that case in the courts so we need the Localism Act to come into force in full. Local communities have no chance of fighting “unwanted" on-shore wind farms” under the Government’s planning reforms, a group of academics, politicians and celebrities warns today. Billions of pounds’ worth of investment in Britain’s energy infrastructure is under threat amid fears the government’s commitment to wind energy has wavered, it has emerged. Includes a poll which shows a a majority in favour of the question "Do you believe wind turbines are a threat to the British countryside?". Please place your vote now! Farmers in Devon should stay with farming and leave energy-production to someone else, a leading rural campaign group has said. So says Mike Bruton, chairman of the Campaign to Protect Rural England (CPRE) in the Duchy (of Cornwall), who also described the Government’s wind energy incentives as a "scam". A Lot of Hot Air! Chris Heaton-Harris, MP for Daventry, discusses his Ten Minute Rule Bill that, if enacted, would allow local authorities to determine their own exclusion zones for wind-turbines from dwellings. Responding to Climate Change (RTCC) is a Non-Governmental Organisation and an official observer to the United Nations climate change negotiations dedicated to raising awareness about climate change issues. Wind power is expensive and ineffective at cutting CO2 say Civitas. In conclusion the report says: "The wind projects do not fulfill ‘sustainable’ objectives. They cost more fuel than they save and they cause no CO2 saving, in the contrary they increase our environmental ‘foot print’". When is this nonsense going to stop? The Government’s latest report on our future energy supply is a tissue of unproved assumptions and wishful thinking. A catastrophic and potentially life threatening failure in virtually any other industry would lead to recall of all examples of the same design/construction with, in serious cases, a stop on further use until the situation has been remedied … or do we have to wait until people are killed or seriously injured in such an incident? "We might just as well build a bonfire of £20 notes for all the costs associated with wind turbines and set light to it. It would probably give out more energy than they ever will." We are also of the opinion that the claims made for the Clotworthy Farm proposal don’t stack up. The proposed Enercon E33 turbine produces 55kW of power at 6m/s (the average wind speed for the location is 5.9m/s: Department of Energy and Climate Change data for grid ref. SS7008). To achieve its rated output of 330kW it needs a wind speed of at least 13 m/s or 29 mph (that’s the speed at which large tree branches move, overhead wires begin to "whistle", umbrellas are difficult to keep under control). Planning Application withdrawn for 50kw wind turbine mounted on a 25 metre tower at Mounticombe Farm, Chawleigh. See CPRE’s letter of objection. In the high winds today over Scotland, a turbine bursts into flame on the coast of North Ayrshire.